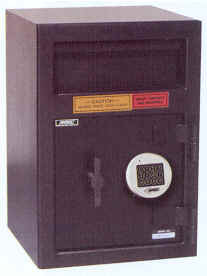 AMSEC's DS series of Depository safes are designed to provide immediate deposits and secure storage for cash, jewelry, and miscellaneous valuables. DSF2014C is Front Load Hopper. Protected by dual "anti-fish" baffles. Clear Door 9¾" x 9¾"